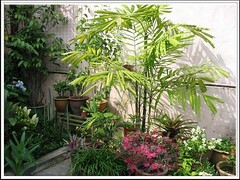 Plant type: An evergreen perennial ornamental shrub, native to China, Southeast Asia and Japan. Light: Prefers full sun but can be sited at partial shade to shade areas. Moisture: Normal to moist, though can be quite heat and drought tolerant once well established. Soil: It’s adaptable to a wide range of soil types but must be well-drained. Sandy loam and acidic soil is preferred. Propagation: Easily propagated from soft or firm stem cuttings. Can be grown from seed as well. 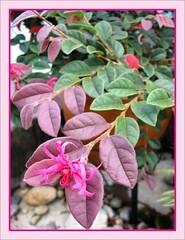 Features: Originating from the Hunan province of China, Loropetalum chinense var. 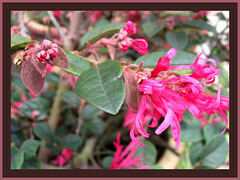 rubrum (Pink Chinese Loropetalum) has different growth habit and a wide variety of flower and foliage colors. It is an evergreen ornamental shrub/tree that matures between 6-10 feet tall with an equal spread, depending on the cultivar. Some species have upright growth habit maturing as trees, others are compact and shrubby, or prostrate-like with their slender arching branches. 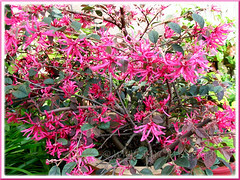 Their rough-textured, alternate and variable ovate leaves (1-2 inches long) can range in interesting colors from light to dark burgundy, or reddish-purple to dark olive green, or ruby red to rusty brilliant red according to the various Loropetalum cultivars available, with foliage changing color as they mature and dependant on the amount of sunlight received. Flowers are narrow strap-shaped petals that dangle like fringe and similar looking to the witch hazel, hence named ‘Chinese Witch Hazel’. Flowers range from stunning pink to reddish purple of varying hues! The popular pink flowering cultivars are ‘Burgundy’ (synonym for ‘Sizzling Pink’), ‘Blush’ and ‘Ruby’, the latter being a true dwarf form. Usage: Loropetalum chinense var. rubrum will be excellent as an accent plant in any garden or landscape with its uniquely colored foliage and shocking pink flowers. Since it can be trained as a single-trunk or multi-stemmed tree, it’ll be great at a garden patio in a stand-alone container, though grown on ground, it’ll be equally impressive. It’s useful too in informal hedge, mixed borders and screen. For sub-tropical & temperate regions: Check this site and here too for additional plant info and interesting introduction to other Loropetalum cultivars! Burgundy Loropetalum – another plant which became an instant favorite of ours! Its maroon-burgundy-purplish and olive-green foliage with magenta-red or shocking pink flowers absolutely captivated us when we first saw it at a garden nursery 3 years ago. It was a beautiful matured plant of about 4 feet with such abundant flowers in a lovely container but it cost a bomb! Though mesmerized, we’re definitely not going to be slaughtered by its seller! We gardeners can be very patient, our plants taught us well! ;) Instead, we scouted and brought home a very young plant which was propagated from stem cutting and cost only RM4.00 (equivalent price for a bowl of noodles), as compared to RM130.00 for the matured tree! 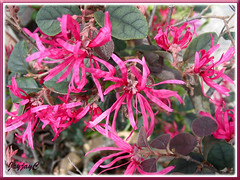 Updated September 29, 2007 – View more images of our Sizzling Pink Loropetalum which bloomed beautifully a week after being pruned in mid-September, 2007! Hi there. May I ask you a question? I wonder why few branches of my loropetalum tree had dried leaves at one time? Not all branches affected. Then after few weeks it will grow the new ones. Is it normal? Yes Ahmad… it is normal. It even tolerates hard pruning and come bouncing back easily.